The flooring within your home affects how you use every room of your property. At the same time, it defines the look and feel of every living space. If your flooring is old, damaged, or unsightly in any way, you and your family cannot enjoy your residence to the utmost. As a local remodeling contractor, I help the clients of Vogel Home Improvement dramatically improve every room of their homes by installing brand new tiles and flooring in Anchorage. Whatever part of your home needs updating, I can help you achieve your goals, starting with professional flooring installation and tile work. When you hire Vogel Home Improvement for your next flooring project, you can feel confident knowing that you choose the best remodeling contractor in Anchorage for the job. For the last two decades, I have been dedicated to providing each of my clients with the highest quality and most customized services possible. I can help you select and install the best flooring materials for both your aesthetic and functional needs and goals. Your complete satisfaction will be my highest priority. Call Vogel Home improvement today if you are planning to install new flooring or tiles in your Anchorage home. I would be happy to discuss your prospective project with you and to answer any questions that you may have about your ideal flooring material. Let's schedule your consultation today! The natural warmth and beauty of hardwood flooring is unsurpassed by any other building material. If you are interested in installing hardwood floor in your home, the first thing that you should do is consult with an expert. Different hardwoods are manufactured to stand up to different environmental conditions. Traffic patterns, temperature fluctuations, and moisture will affect the performance of your hardwood floors. 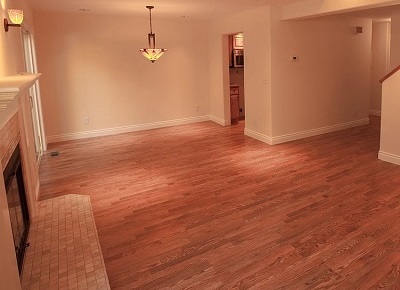 When you hire Vogel Home Improvement to install hardwood floors, I will guide you through the entire process. As a local Anchorage flooring expert, I can help you select the hardwood flooring that will work best for you in every room of your property. You and your family will be transfixed by the stunning beauty of your new hardwood floors for years to come. If you want to make a truly unique change to your Anchorage home, you should consider installing tile floors in your property. The design possibilities are endless. Flooring tiles come in countless colors, shapes, styles, and finishes. You can make a pattern that is customized to your family's aesthetic tastes. These hard-wearing and low maintenance flooring tile will look amazingly beautiful for decades to come. If you are interested in my services for tile and flooring in Anchorage, please call 907-337-7439 or complete my online request form.